I did it. Hope you win! Congratulations Ricki!! Of course you deserve an award for best writing, I’ve been saying that for ages! You rock, lady!! You have my vote, and I will definitely spread the word on my next post! YAY! I’m so excited for you!! Go Ricki! Go Ricki! Go Ricki! I just voted for Super You! How thrilling! And well deserved to boot – Yes You Can! Love the photo of The Girls, of course!! congrats, Ricki! that’s SO AWESOME! you better believe i’m voting for you! wahooooooooooooooooooooo! I’m off to vote for ya! Congrats, Ricki!!! congrats!!!!! you must be so so so so so so excited! you deserve it.. i mean look at this blog.. its amazing! Congrats! That is so exciting! I just got done listening to the inauguration coverage on NPR at my desk (while I was working, of course! ), and I will vote for you once I get home :o) It is nice to think that our votes really DO count! Congratulations!! That is great news! Congrats on the nomination! That is very cool. I voted for you! Congrats on the nomination, it is well deserved!! Voting is done – and crossing everything I can. You totally deserve it. I wish I had a tenth of your story telling talent. Can’t wait to see your cookbook!!! Congratulations, you have my vote! Congrats! You have my vote too. This is grrrrrrrrrrreat news. I voted. Hope you win! Congratulations! A real testament to your writing skills. How exciting! I’m off to vote! Voted for you! Best of luck!! congrats!!! so exciting 🙂 my vote is counted!! Good luck! I just voted for you. I hope you win. Congratulations Ricki! That is fabulous news and well deserved. You do have a great story telling style. Keep up the good work! I voted – you deserved to be nominated and you deserve to win!!! Yay! A very huge congratulations and of course you have my vote! Congratulations Ricki! I’ll be sure to vote for you. Underdog, my arse! I’ve voted for you. Twice. Ssshhh. off to go vote for you, Ricki, congratulations to you! very well-deserved, no doubt. Woooah! How exciting! Congratulations! I’m gonna go vote for you now! I hope you win! Wow Ricki!! What a well deserved honor! I will of course head over and vote for you. Your writing and photography on this blog are both amazing and I enjoy every time I visit. I so hope you win! I am so happy for you! 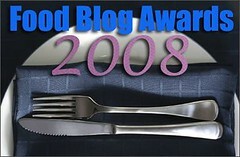 Your blog is a joy to read, so it’s really no surprise to see you nominated. I’m keeping my fingers crossed!